The Space Shuttle Atlantis will land during one of the times below, and in one of the listed locations, between Thursday July 21 and Saturday July 23, 2011. The shuttles energy reserves will be 14 hours (it’s ability to keep flying) after these landing times. 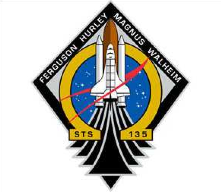 STS-135 Mission crest. 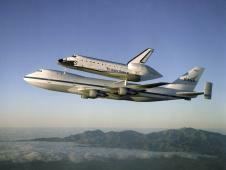 The final shuttle mission will end between Thursday morning, July 21, and Saturday afternoon, July 23, 2011. Overnight, July 20-21, the shuttle undocked from the International Space Station (ISS), did a fly around the station before easing into an orbit that gradually, orbit by orbit, increased the distance between itself and the ISS. Atlantis is moving into a landing trajectory and then, about an hour before landing, will do a de-orbit burn to land at one of its three listed landing areas. It is expected to land at Kennedy Space Center, Florida, the most preferred location of the three locations. What happened when a Shuttle didn’t land in Florida? 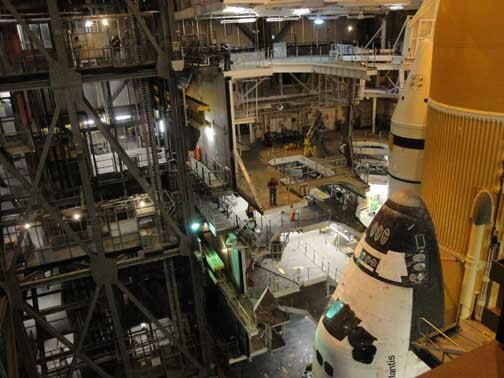 When the weather or other conditions forced the shuttles to land in California or New Mexico, the shuttles had to be returned to Florida for servicing and to be prepared for another launch. Accomplishing the return of a shuttle from an alternative landing site was time-consuming and expensive. The first landings of the shuttles were planned for Edwards Air Force Base, north of Los Angeles, because of the size of the landing area. Edwards is a large dry lake bed in the high desert. But once landing was mastered which happened soon enough, the shuttles landed in Florida. With a few exceptions through the 135 shuttle missions, Kennedy Space Center, Florida, is where they returned from space and landed. When a shuttle landed elsewhere, it was returned to Florida on top of a Boeing 747 specially rigged to carry it. Carrying the shuttle on top of a 747 was also used in flight tests before the actual shuttle missions in space began in 1981. When a shuttle landed on its own in Florida, it was relatively easy (nothing was ever really easy in the shuttle program); the shuttle was simply towed back to one of three OPFs (“orbiter processing facility” or hangar). When the shuttle returned to KSC and landed atop a 747, the 747 would taxi to the south end of the SLF (“shuttle landing facility” or runway) and using the device shown in the large photograph below, the shuttle would be removed from the 747, and then towed back to one of the OPFs. Returning the shuttle after landing at an alternative landing site was expensive and time-consuming. To return to Florida after a landing at Edwards Air Force Base, California, took two flying days and, reportedly, cost more than a million dollars. I took this photographs, and the one below, on one of my visits to the southern end of the SLF on May 17, 2011. When shuttles were returned to KSC atop a 747, they taxied to the south end of the runway (SLF) to this device where the shuttle was removed. Arguably the night of May 31 / June 1, 2011, will go down as one of the greatest nights in the shuttle program. 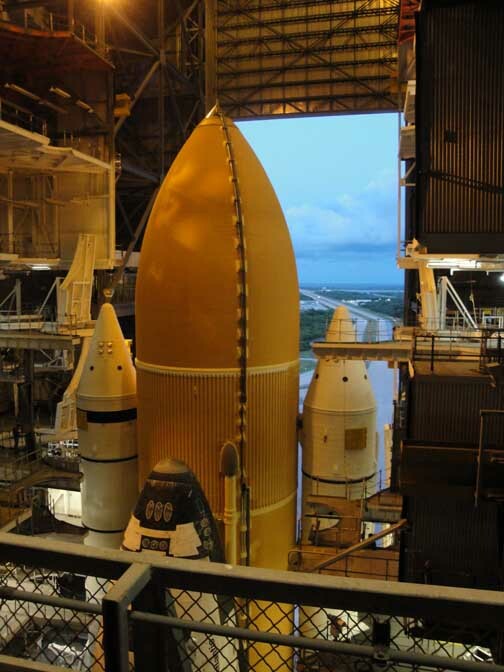 In the evening the final shuttle mission continued toward launch with the rollout of the shuttle Atlantis from the Vehicle Assembly Building. Game on! The sign tells it all -- behind Pete to the left is the landing field. Endeavour is coming home tonight, but that's not all that will happen tonight at the Cape. Before the Atlantis arrived at Pad 39-A, hours later, Endeavour slipped out of orbit 200 miles above the Earth between the Indian Ocean and Ausralia and glided back to Earth for more than sixty minutes, landing at Kennedy at 2:32 am ending the second to last mission in the 30-year shuttle program. Along the way there were interviews with the crew that will fly the last mission ever, and opportunities to photograph the Atlantis at 39-A as the sun rose over her, and as the sun was setting on the American shuttle program itself. By dawn, June 1, 2011, the second to last shuttle mission was over, and the final mission, STS-135, was on the launch pad, poised ready to begin. Lift-off is scheduled no earlier than July 8, 2011 — but there is talk of bumping the launch up to July 4. The following 25 photographs, taken between 4 pm and 4 am, document only a part of this remarkable evening and morning at the Cape. The Vehicle Assembly Building, diagram. Let's get oriented -- where are we going? Here's your floor plan of the Vehicle Assembly Building. First we'll enter the Transfer Aisle from the "you are here" at bottom of the diagram walking first forward through Areas K, L, M and N, largely storage areas, albeit it huge ones. Straight ahead is the door through which the shuttles entered when being brought over from their hangars. Inbetween us, and the Transfer Aisle are Areas K,L,M and N, the ceiling of the VAB, while high, is much lower. and then we'll turn into High Bay 1 between Towers D and E. Here our photographs will be on the ground floor, 4th floor, 5th floor and 16th floor. All locations in the photographs will be identified. 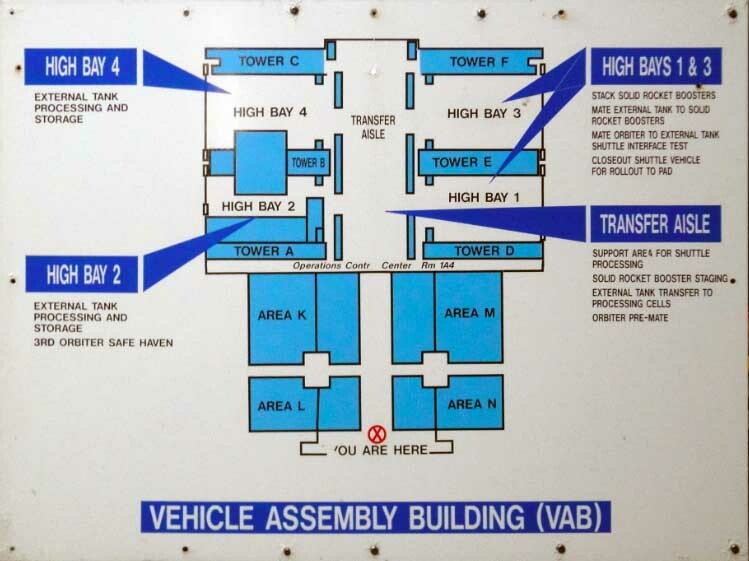 The VAB is 37 floors, roughly 500 feet, but the shuttle only reaches to about th 16th floor. During the Apollo Moon program in the 1960s and early 1970s, all of the height of the VAB was required to assemble the Apollo rockets. The Vehicle Assembly Building, main floor. 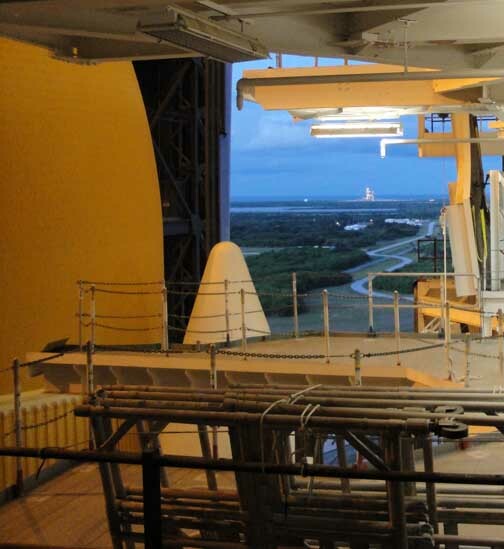 The main hallway of the Vehicle Assembly Building where only 10 days before the Atlantis was wheeled in, turned upright and lifted 500 feet up, and then back down, and placed on the crawler that tonight and tomorrow morning will carry her to Pad 39-A, and on to space. The Vehicle Assembly Building, main floor. This is the Crawler -- slow but steady. Once it begins moving it is about 6 hours from VAB to Pad 39-A, a distance of a few miles that is transversed on a roadway of small river rock. The Vehicle Assembly Building, 5th floor. 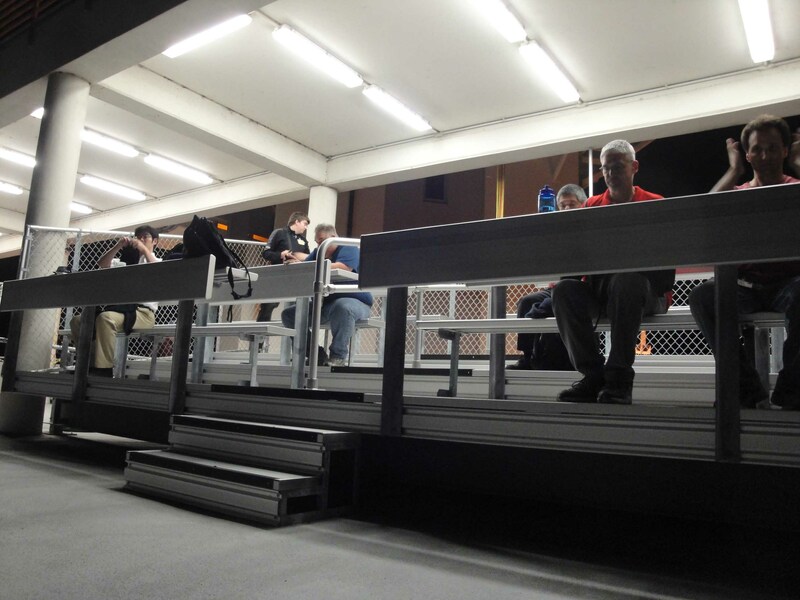 The Crawler upper deck. The media herded between the main level, and floors 4, 5 and 16. A lack of personnel, and a growing disdain for the media by all but a few of the Kennedy Space Center personnel has created problems, perhaps compounded by the difficulty of sorting out legitimate media in an era of bloggers and decreased resources of traditional media such as daily newspapers and television networks. The Vehicle Assembly Building, 5th floor. Isn't she beautiful. The Atlantis perched and secured atop the Crawler. 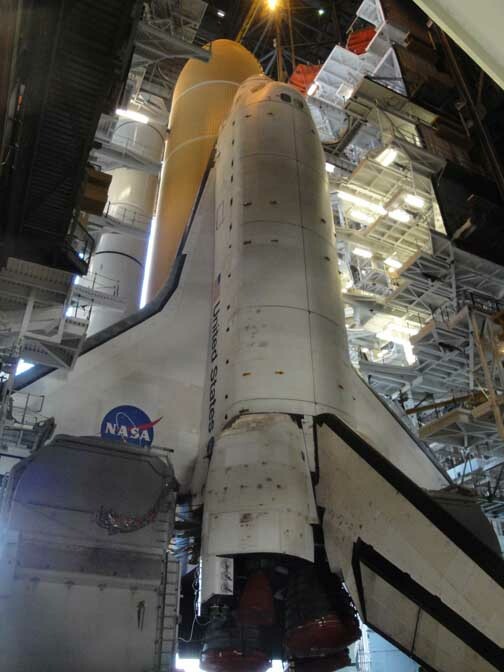 The shuttles are breathtaking, the closer you are to them, and the more you learn about these remarkably engineering machines, the more in awe are you of the men and women who built them, serviced and protected them, and flew them. The Vehicle Assembly Building, 16th floor. , and through the window is the crawlway. That is not a two-lane divided highway you are looking at. The crawler's giant paws run are on each of that grassy divider and, by the way, they need the room. In a few moments, the crawler and Atlantis will head out onto what appears to be a four lane divided interstate. It's no interstate. This road is a one way crawlway for the shuttle. The Vehicle Assembly Building, 16th floor. In the distance is Launch Pad 39-A lighted, and beyond is the Atlantic Ocean. The launch pads are on the shore. The Vehicle Assembly Building, 16th floor. Another view of the bay, looking downward from the 16th floor. The Vehicle Assembly Building, 16th floor. 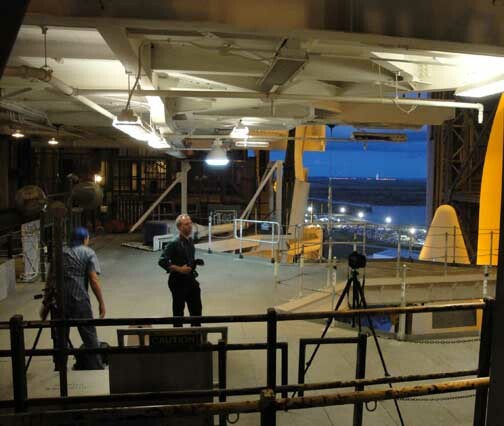 Photographers lean forward over yawning openings in the assembly bays, often pointing their cameras straight down. On some levels they are allowed out onto even narrower catwalks on each side of the bay. Note the reenforcing of the walkway. The other side of this catwalk overlooks the Transfer Aisle. The Vehicle Assembly Building, 16th floor. 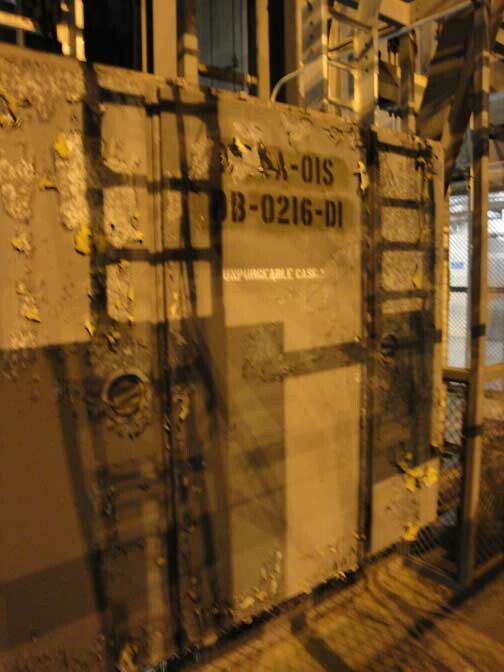 There is nothing clean, nor safe, about the VAB. The catwalks are narrow and the open spaces are, of necessity, huge. It is often dirty, as with this piece of electrical equipment from which the paint is chipping off. As someone said, "nobody's cleaned anything up in decades up here"
The Vehicle Assembly Building, 16th floor. 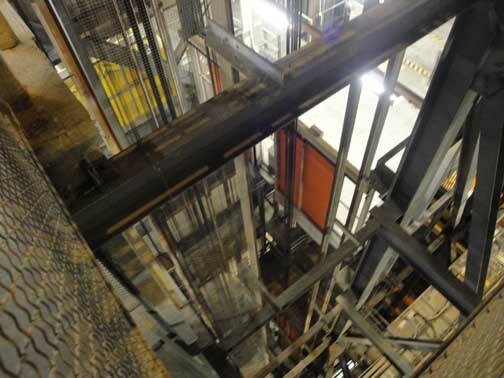 Elevator shafts are guarded only by metal mesh. 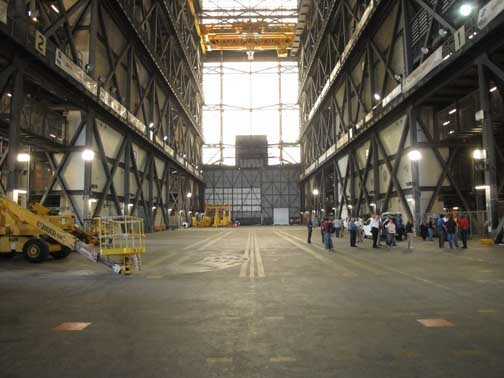 The VAB is an industrial facility, utilitarian, not meant to be pretty. The Vehicle Assembly Building, 16th floor. 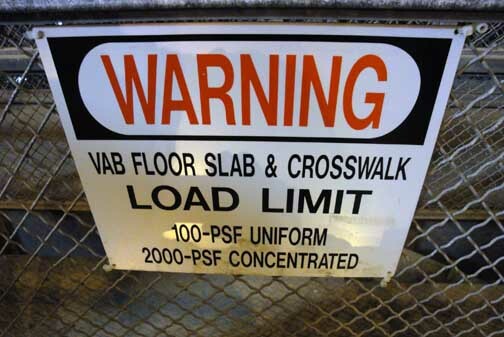 Warning signs are everywhere in the VAB, in elevators, on catwalks, in the hallways. Vehicle Assembly Building, 4th floor. Going .... 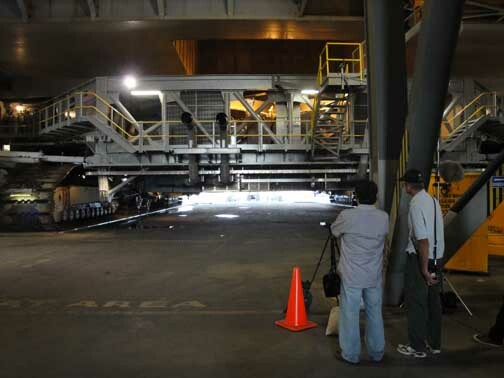 When the crawler begins to move, the shuttle exits the VAB fairly quickly. The crawler is slow but steady and in minutes it is gone, the bay cleaned up and gates and fences re-erected. Vehicle Assembly Building, 4th floor. Going ... Once out of the VAB, the shuttle is bathed in light. 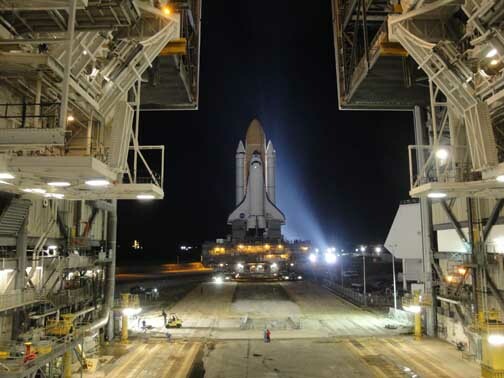 Earlier in the program the shuttles were moved from the VAB to the Pad in the morning, but during the final launches, the shuttles were only moved at night. 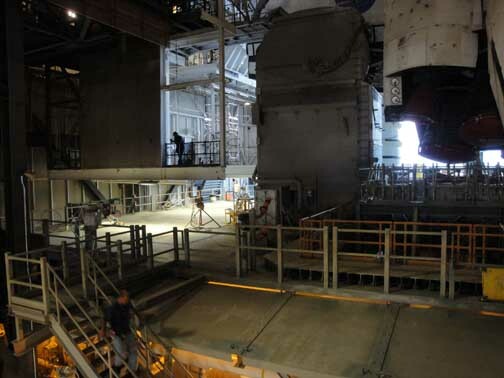 The press, often invited to walk along during the day to the pad, was barred during the final missions. Vehicle Assembly Building, main floor. Gone! ... gates have been closed and the shuttle Atlantis has left the VAB for the final time, barring weather conditions that would require her to return for safety. The future of the VAB, the largest building in the world in terms of volume, is uncertain, but government officials are profiling the building for several companies that have expressed interest in acquiring the building. Who are they? No one will say, but word is three companies are interested. 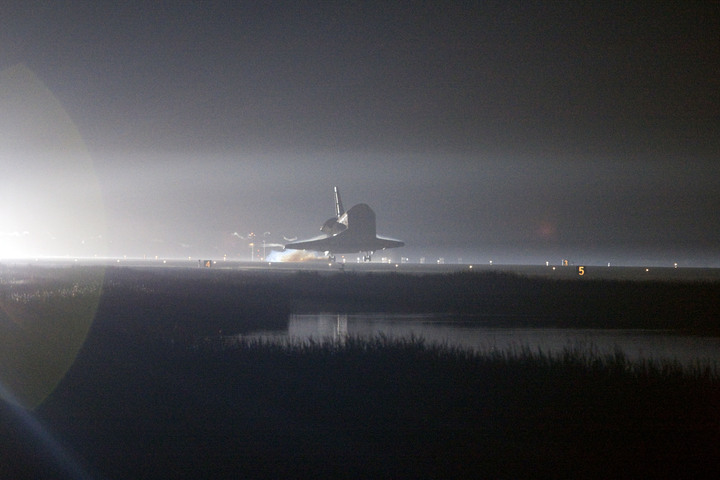 The landing of the Endeavour, and the end of the second to last mission, STS-134. With the final shuttle out of the VAB and another major step of the final shuttle mission, STS-135, accomplished, attention turned to the Shuttle Endeavour which had been at the International Space Station until two days before, and which was now preparing to land at Kennedy Space Center’s shuttle landing facility. 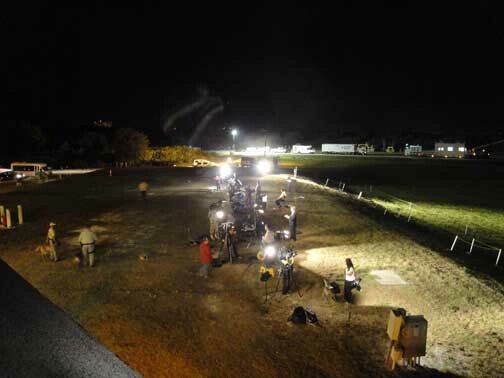 NASA began running the press buses the short distance to the SLF (shuttle landing facility) at 11:30 pm. Carol Anne caught the first bus. Unlike the landing of Discovery in February, which was a daylight landing, this landing would be at 2:32 am — and, given the excellent weather conditions, it seemed likely that Endeavour would land on the first of its two landing opportunities. If it could not land, the Eneadavour would remain in orbit another day and would have two additional landing opportunities the fiollowing night. The landing opportunities have to do with the orbit tracks. Each time the shuttle orbits it tracks a slightly different course. Only a couple of those tracks are suitable for landing in Florida while other tracks are suitable for other landing sites such as White Sands, New Mexico and Edwards Air Force Base, California. In February, we had photographed the landing from the north end of the SLF (shuttle landing facility = runway). 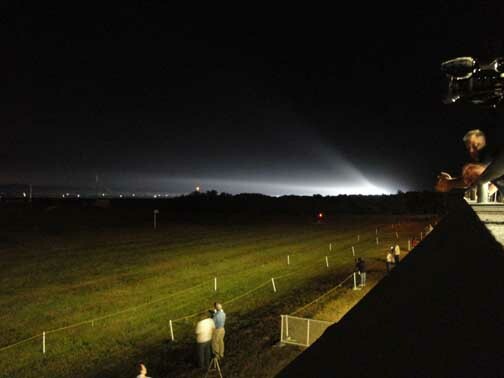 Tonight we would photograph from mid-stride of the landing field at “The Tower” where there are grandstands and other facilities. But reality was, on a largely moonless night, we would suspected that we would witness the landing of the Endeavour, but get nothing in terms of photographs. That proved to be true. At 12:30 am I climbed in the second of two media buses and joined Carol Anne at the SLF. The weather was so favorable, the Endeavour was cleared to do its landing burn well in advance. She was coming home. The burn slows the speed of the shuttle from nearly 18,000 miles an hour causing it to slip out of orbit. By the time the shuttle lands sixty minutes following the de-orbit burn, she is flying at only 200 miles an hour. The de-orbit burn is about 60 minutes before landing and takes place almost exactly on the other side of the world. This morning it was off India over the Indian Ocean near Australia. Once the de-orbit burn begins, the shuttle has no where to go except to the SLF in Florida. Her speed no longer sustains orbit. After that burn for 60 minutes everyone waits knowing she is coming. 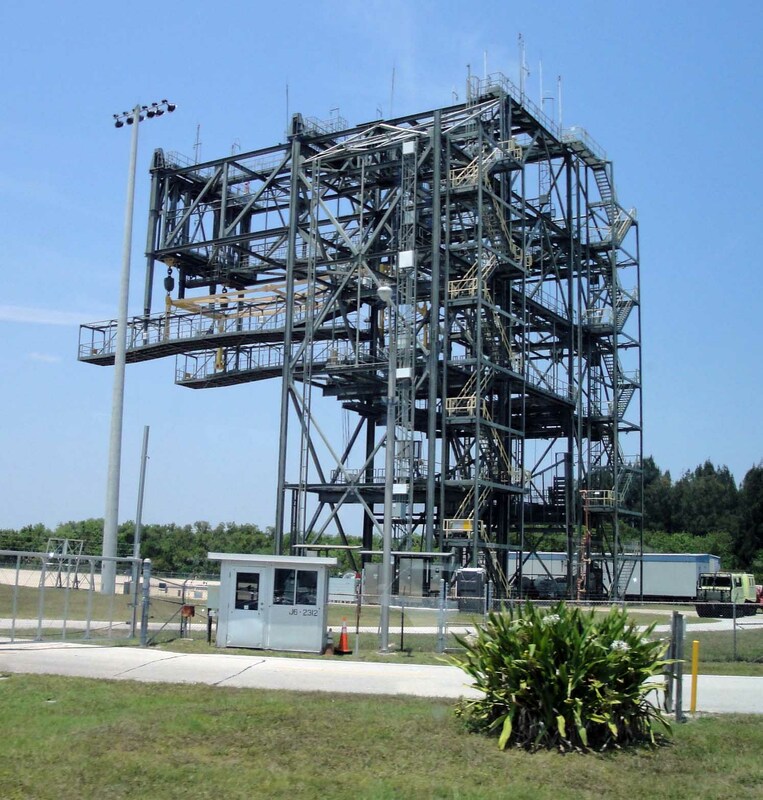 Shuttle Landing Field Tower at Kennedy Space Center. Grandstands for the media and VIPs are just below the tower. The tower is halfway down the runway known as the SLF, shuttle landing facility. The shuttle takes about 2/3s of the runway to land. The shuttle leaves orbit at 18,000 miles an hour about 220 miles up and touches down 60 minutes later at 200 mph at sea level. Runway, shuttle landing field, Kennedy Space Center. TV and electronic media set up on the south side of the grandstand at the SLF. 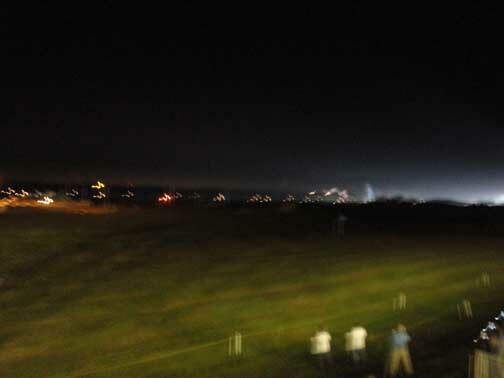 Nobody got much in the way of pictures when Endeavour landed because it was so dark. Runway, shuttle landing field, Kennedy Space Center. The convoy which will service the shuttle after landing, tow her back to the hangars and pick up the astronauts, arrives about 30 minutes before landing and waits just off the runway midway down the field. The convoy uses the same road the media uses to get to the grandstand. Because of the size of the convoy, the media must, therefore, go to the grandstand area first. The convoy fills the road making further passage difficult. That's why, in spite of the grumbling, the final media buses to the SLF must leave the press site so early. Runway, shuttle landing field, Kennedy Space Center. The media arrives as much as 3 hours before landing with little to do except lounge against walls or make phone calls. Internet and cellphone coverage is now excellent at the landing field unlike earlier days. With desks the media are able to work. Well, unless you are eaten by bugs. Bring bug spray when you come. Runway, shuttle landing field, Kennedy Space Center. Work areas in the grandstand are surprisingly good, clean and well lighted. 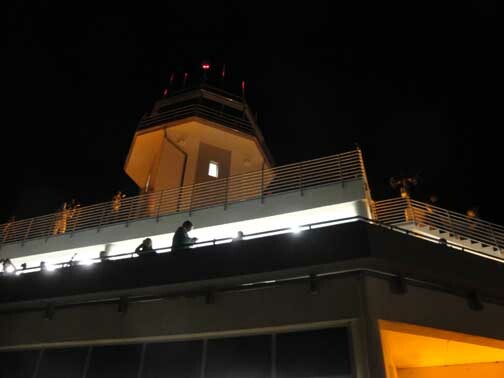 Views of the runway are also excellent in daylight or on nights with full moons. Runway, shuttle landing field, Kennedy Space Center. 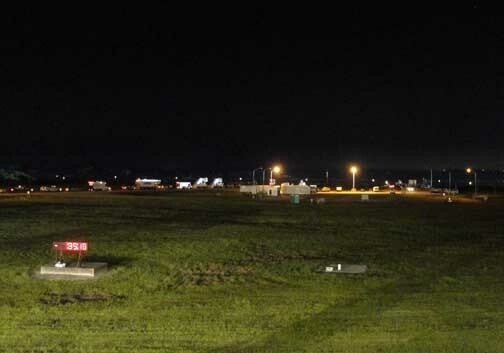 The northern end of runway 15 where the shuttle was scheduled to land was well lit. Runway, shuttle landing field, Kennedy Space Center. Tracking the shuttle and monitoring mission control in Houston was easy. 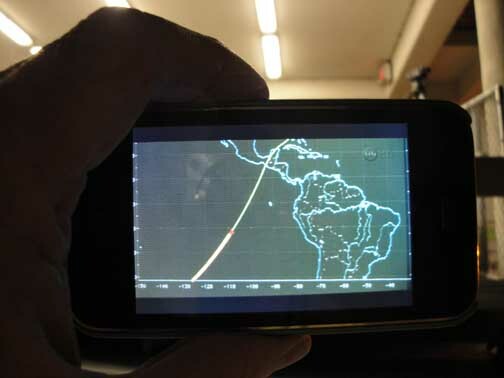 Here I have the tracking on my iPhone which is logged onto http://www.nasa.gov, a superb web site. At this time the shuttle was approaching central America 42 miles above the earth. Runway, shuttle landing field, Kennedy Space Center. The landing. You don't see anything? If you had been there you would have. 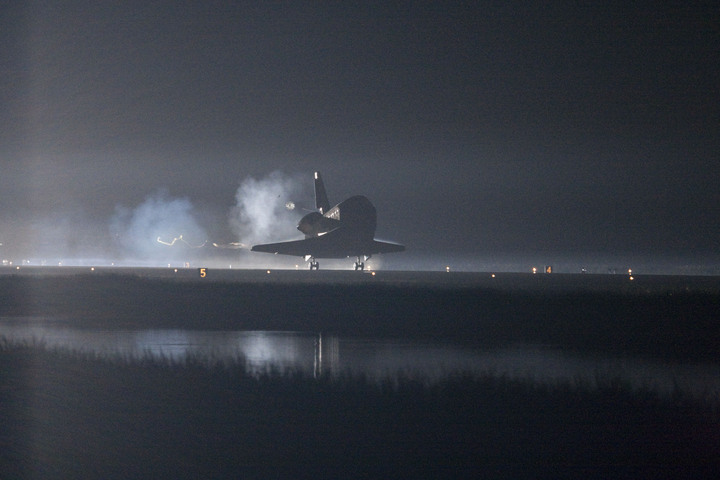 The shuttle appears suddenly emerging out of the night fog and WHOOSHES by. It is breathtaking, but photography was impossible more sophisticated equipment and a much better vantage point. I have covered dozens of launches and landings in California and Florida. Itt never gets old. It gets me every time. Here are some NASA photographs of the landing from better angles and better equipment. STS-135 Mission begins. 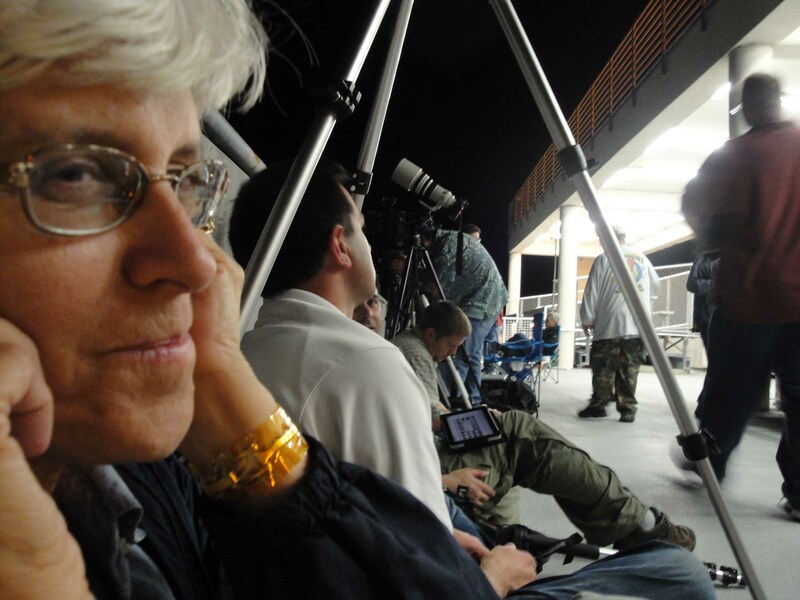 An unexpectedly large number of the media showed up long before dawn for the rollover of the Atlantis on Tuesday, May 17, 2011, catching the NASA media center personnel off guard. Here are the primary steps in preparing a shuttle from its landing at the Shuttle Landing Facility (SLF) at Kennedy Space Center to launch. When a shuttle mission ends in California or another alternate landing site such as White Sands, New Mexico, an additional step is required — flying the shuttle back to Kennedy Space Center riding on top of a Boeing 747. Alternate landing sites are used when weather at KSC remains unsatisfactory on repeated days and the shuttle is running out of expendables and must land. The shuttle has a limited number of landing windows each day, just as it has limited launch windows. This is the Rollover of the Atlantis and beginning of STS-135, final mission in the American Space Shuttle program. It is 8:37 am. 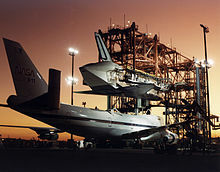 Atlantis has been backed out of Bay #2, its hangar, on left side of photograph. 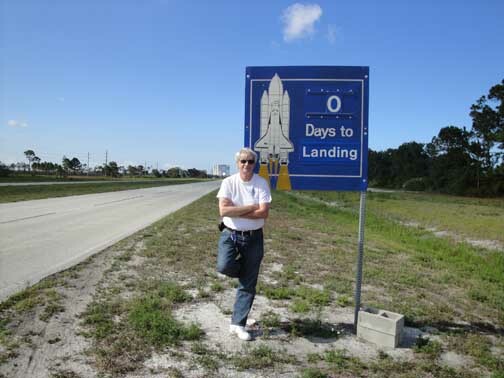 Then it will be driven to the Vehicle Assembly Building (VAB) just to the left of where this picture was taken. Return to OPF. After a shuttle returns from space, it is towed back to one of three Orbiter Processing Facilities (OPF) where it is prepared for another flight. It is towed along a blue line painted on the highway. The three OPFs are hangars, but also maintenance facilities. The shuttle Atlantis has been in OPF Bay #2 since its last mission. The Rollover. 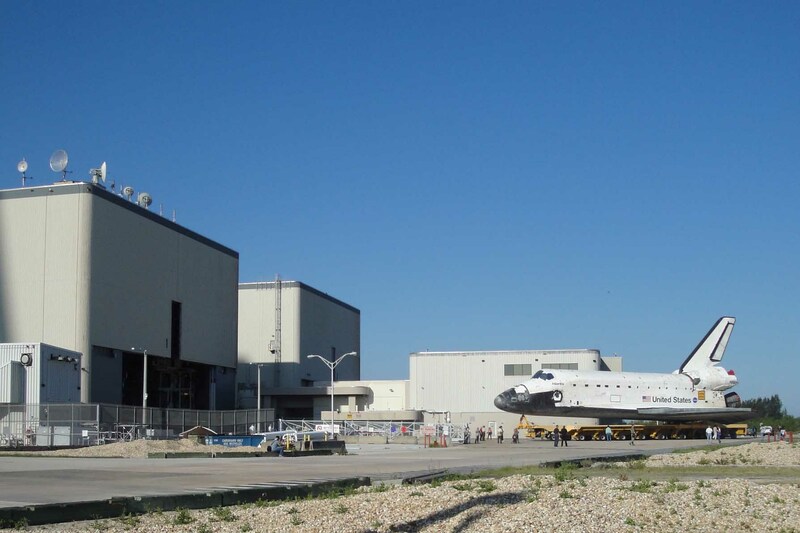 A new mission begins when a shuttle is “rolled over” from its Orbiter Processing Facility to the Vehicle Assembly (VAB) building several hundred yards away. 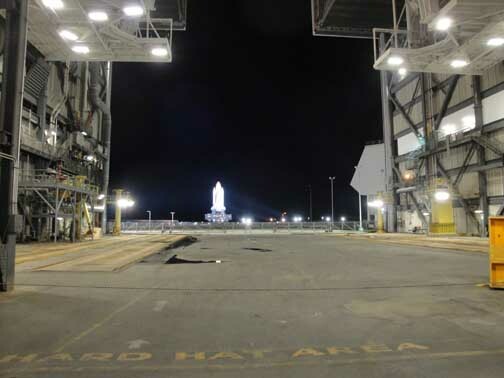 The rollover of the Atlantis took place beginning at 8 am from Bay #2, on Tuesday morning, May 17, 2011, to the Vehicle Assembly Building and was completed about 3 pm. Normally rollover takes a few hours, but because this is the last mission in the program, and the last mission for Atlantis, the shuttle was parked outside of the VAB. This interrupted the rollover allowing KSC employees and others to walk around and visit. Atlantis nears the door of the VAB in background. She was stopped and parked here for six hours so that NASA employees, many who will be laid off by the time she flies, could say good-bye. Lift to Mate. 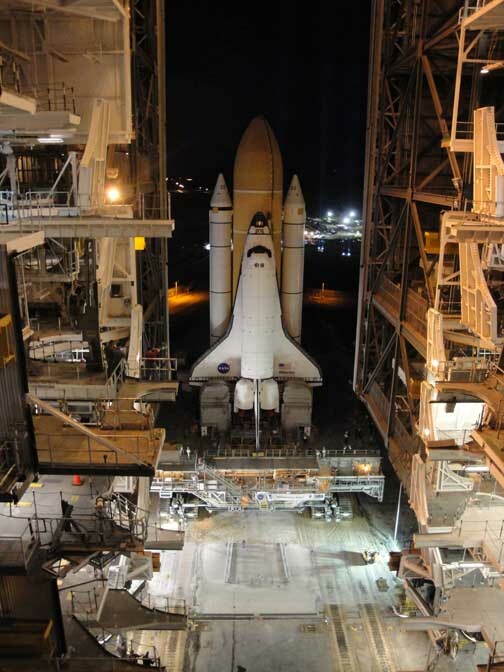 The next step in the process takes place inside the Vehicle Assembly Building (VAB) where the shuttle is lifted on end, and mated to the Crawler which will carry the shuttle out to the launch pad. 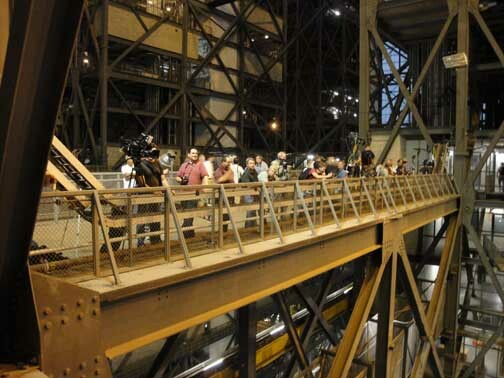 This was scheduled to be a media event inside the VAB overnight May 17-18, 2011, but re-scheduled to Wednesday morning, May 18, 2011, possibly to accomodate the unexpectedly large number of media wishing to cover the final Lift to Mate. The Rollout. 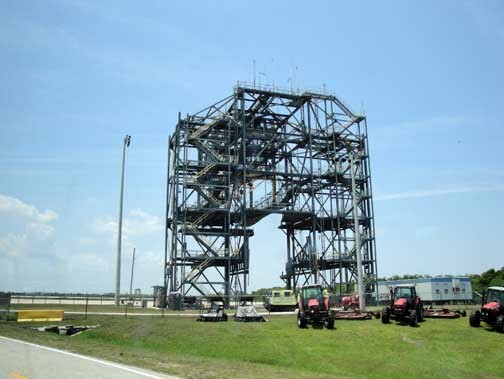 The final step in moving the shuttle from the OPF to the launch pad is to roll out the Crawler from the VAB to the launch pad with the shuttle riding on top. This takes about 6 hours and occurs a week or two after Lift to Mate. A launch date has yet to be set for STS-135 but will likely the launch will be in mid-July. This will be mission STS-135, the final flight in the American space shuttle program. Brief Atlantis History The Atlantis was the fourth of five shuttles. All were built in Palmdale, California. The first two, Columbia and Challenger, were lost. The third, Discovery, has flown her last flight and is in Bay #1 of the OPF being readied for the Smithsonian Museum at Dulles Airport outside Washington, DC. Discovery is expected to be handed over to the museum early in 2012. The newest, and fifth shuttle in the fleet, Endeavour, is currently in space. She was launched at 8:56 am, May 16, 2011, and is expected to return to Earth on May 31, 2011, after her final sixteen day mission. The Current Header Photograph was taken at 9:30 a.m. 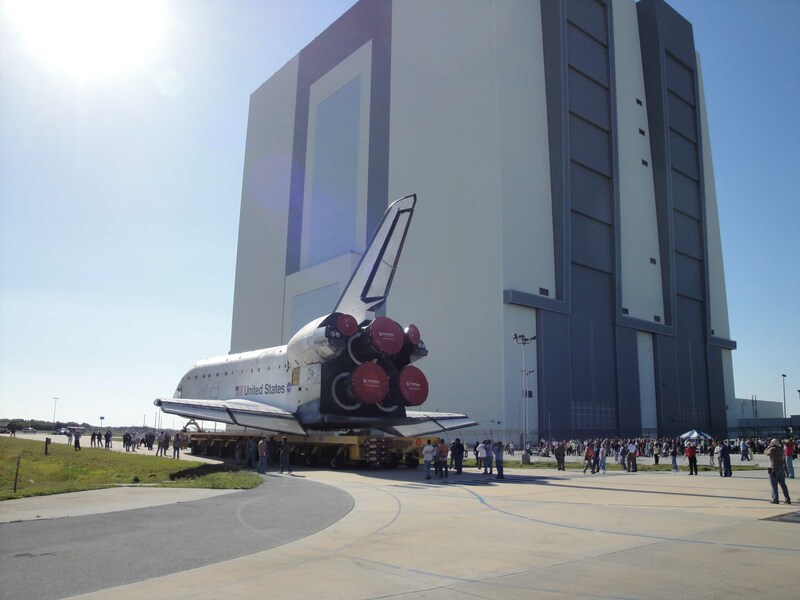 The Atlantis was parked outside the VAB for six hours allowing staff to visit and be photographed with her. Astronauts who flew on her walked her from the ORF toward the VAB. The four Astronauts who will fly the final shuttle flight also walked along with the Atlantis. NASA updates on the Atlantis and on STS-135 as of May 17, 2011, appear to be being posted HERE. photographs by petecrow for Seine/Harbour® Productions, LLC, Studio, City, California, “petecrow/NASA” © 2011 by Peter M. Crow and the Peter Michael Crow Trust and by Seine/Harbour® Productions, LLC, Studio City, California.